Jeff Fromm is a top-ranked professional speaker on the topics of youth marketing, consumer trends, and innovation. He is a weekly columnist for Forbes and co-author of three youth marketing books: Marketing to Millennials, Millennials with Kids, and Marketing to Gen Z.
Jeff has more than 25 years of marketing consulting experience across a variety of brands. His strength is identifying profitable growth strategies based on changing consumer behavior. Jeff spearheaded the Millennials research partnership with The Boston Consulting Group and Service Management Group. In 2011 he founded the consumer trends insights and youth marketing conference, Share.Like.Buy. Jeff graduated from The Wharton School of the University of Pennsylvania, and attended The London School of Economics. He is a married father of three grown Millennials. Jeff’s engaging, entertaining and relatable presentation helped drive home the importance of an omni-channel approach for Millennials. I fully intend on leveraging Jeff in future, and unreservedly recommend him. 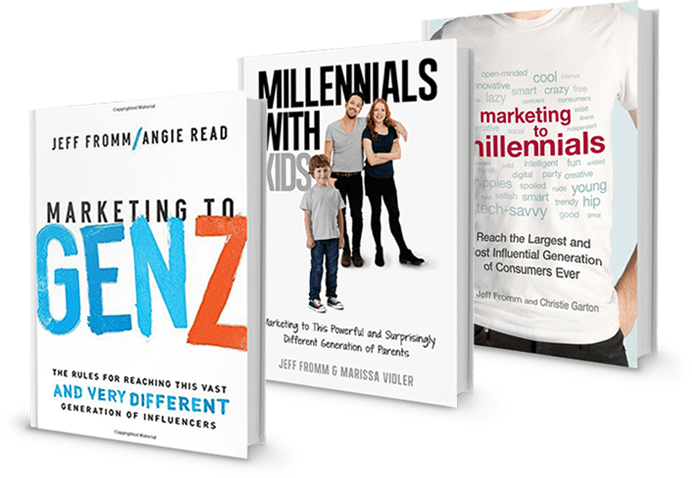 Grounded in research and chock-full of actionable insights, Jeff Fromm is a ‘must know’ for anyone who wants to know what really works in engaging and winning the loyalty of Millennials. Jeff was able to provide great insights and unique information to a group representing many different areas of Target. He is a true expert in the field, and an excellent resource. Through compelling examples of brands that are getting it right and those that still have much to learn, Fromm offers useful insight into the values, insights and behaviors that shape this pragmatic generation. Jeff offers a direct line into the lives of this generation and explains what drives their behavior. He delivers invaluable insights for any brand marketer interested in this generation. Jeff has developed new strategies that not only will help us better understand millennials, but will guide the future of marketing.